After a successful launch event earlier this year and monthly supper clubs since then, Debut Contemporary have teamed up with Italian Supper Club for another special dinner at their gallery in Notting Hill, with artists in attendance and a special musical interlude. 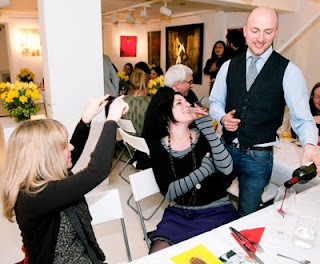 "Debut Contemporary art gallery invites you to dine with 6 of artists, listen to a live music performance, and enjoy a bespoke fine dining experience in a contemporary Notting Hill gallery setting, celebrating the fusion of intellectual and creative minds. Rising Star Michael Petrov will be one among 100 musicians to be invited to perform in this year's Chelsea Music Festival NYC, and we are thrilled to hear a taster of his talent during this month's art dinner. The Chelsea Music Festival, now in its fourth consecutive season takes place in New York City from June 14 to June 22, 2013. With over 15 planned events celebrating the visual, performing and culinary arts, the Festival will be honoring the Benjamin Britten centennial, and paying tribute to multi-centenarians, Corelli and Gesualdo. This year’s The British-Italian theme is a thread that runs through all aspects of the music, the artists, as well as the venue spaces. Chelsea Music Festival Artistic director and acclaimed conductor Ken-David Masur has attended the ART DINNER earlier this year and has enjoyed the experience tremendously. We are delighted to be in collaboration for this bespoke dining experience and are looking forward to welcoming you. Cellist Michael Petrov made his first concert appearance at the age of seven with Vivaldi's cello concerto in A minor with the Orpheus Chamber Orchestra. He previously studied at the Yehudi Menuhin School with Thomas Carroll and was awarded a full scholarship to continue his education at the Guildhall School of Music & Drama where he is taught by Louise Hopkins. In 2011 he won the International Suggia Competition in Porto. Michael is supported by the Guildhall School Trust. Guests receive an inspired evening, specially curated with a colourful menu, tasters of live art performance and always a warm inviting atmosphere. The Art Dinner offers the chance to experience art as a lifestyle, and to be part of something brilliant and unforgettable..."